Sparked by a controversial debate in February 2014, Bill Nye has set off on an energetic campaign to spread awareness of evolution and the powerful way it shapes our lives. In his new book, "Undeniable Evolution and the Science of Creation," he explains why race does not really exist; evaluates the true promise and peril of genetically modified food; reveals how new species are born, in a dog kennel and in a London subway; takes a stroll through 4.5 billion years of time; and explores the new search for alien life, including aliens right here on Earth. With infectious enthusiasm, Bill Nye shows that evolution is much more than a rebuttal to creationism; it is an essential way to understand how nature works—and to change the world. 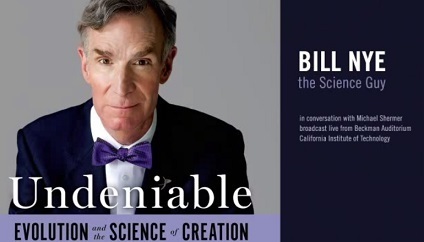 Don’t miss this enlightening “In Conversation” with Bill Nye, hosted by Michael Shermer.